Howell, Keith. "First Nations University of Canada". The Canadian Encyclopedia, 07 July 2016, Historica Canada. https://www.thecanadianencyclopedia.ca/en/article/first-nations-university-of-canada. Accessed 21 April 2019. First established in 1976 as the Saskatchewan Indian Federated College, the First Nations University of Canada (FNUniv) is the only university-college in Canada controlled by First Nations. First established in 1976 as the Saskatchewan Indian Federated College, the First Nations University of Canada (FNUniv) is the only university-college in Canada controlled by First Nations. With over 3,000 students from the University of Regina and FNUniv registered annually in a variety of Indigenous Studies programs, the school fosters an appreciation for Indigenous education and traditional knowledge. Federated with the University of Regina in May 1976, the Federation of Saskatchewan Indian Nations established the precursor to the First Nations University, the Saskatchewan Indian Federated College (SIFC). Independently administered, this new university-college aimed to serve the cultural and scholarly needs of First Nations students. SIFC opened in the fall of 1976 with nine students in attendance. It offered various programs relating to Indigenous Studies, including Indian Studies, Indian Languages, Social Work, Social Sciences and Indian Teacher Education. Since 1983, SIFC has entered into 25 agreements with various institutions across Canada, Asia, Oceania and the Americas. In 1994, SIFC was voted a full member of the Association of Universities and Colleges of Canada. In June 2003, SIFC changed its name to the First Nations University of Canada (FNUniv). In association with the University of Regina, FNUniv maintains an enrollment of over 3,000 students per year. It also delivers services and programs at three campuses across Saskatchewan: Regina (main campus), Saskatoon and Prince Albert (northern campus). FNUniv students have a variety of resources and services at their disposal including academic advisors, university libraries, student associations, accessibility services, co-operative education, counselling, financial aid (including scholarships and awards), housing and more. Each campus also offers the presence of Elders. Working closely with academic departments, the Elders’ offices provide students with traditional knowledge and a connection between their classes and First Nations customs. A board of governors governs FNUniv. The board is comprised of nine members; eight with voting privileges and one a non-voting chairperson. The Federation of Saskatchewan Indian Nations Education and Training Commission forms the selection committee that appoints board members. There is also a male and female Elder on the board, who serve as non-voting advisors. The Elders are appointed by the Elders Advisory Council. One FNUniv faculty member and student also serve as non-voting observers. The FNUniv executive office consists of the president, vice-president (Academic), associate vice-president (Academic) and executive director (Finance). In February 2005, board chair and Federation of Saskatchewan Indian Nations (FSIN) vice-chief Morley Watson fired two administrators and suspended another after an audit. More faculty and staff were fired or quit over the next few months, generally replaced by FSIN appointees. In 2007, the Association of Universities and Colleges of Canada put FNUniv on probation for the firings, and gave the school a year to distance itself from FSIN. One year later, the Canadian Association of University Teachers censured the school, meaning that its members were discouraged from engaging with the university for the time being. FNUniv’s funding suffered during this time. In February 2009, Saskatchewan froze $200,000 of the school’s funding because of internal controversies. While the province restored half of the funding a month later, Ottawa withheld $2.4 million from FNUniv for the same reason. After signing an agreement in 2010 that gave financial control of FNUniv to the University of Regina, the school escaped bankruptcy. Provincial and federal funding was restored shortly after. 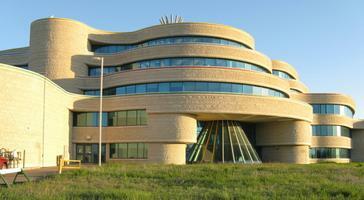 Architect Douglas Cardinal (Blackfoot-Métis) designed FNUniv’s main campus in Regina, which opened in 2003. With its rounded edges, the structure is suggestive of an eagle in flight. Five years later, in June 2008, the university officially opened the Veterans Memorial Tipi — a large glass tipi that surrounds the Regina Campus atrium. The structure honours First Nations veterans who served in the Canadian and American armed forces since the First World War (see Indigenous Peoples and the World Wars).